Greetings! This is Mandy. I am a Biology graduate from Queen’s University, Kingston, Canada. I have been longing to join HKDCS as an intern and this past month was like a dream come true for me! I have always wanted to gain some valuable hands-on field research experience. This opportunity is ideal for me to learn about the current conservation issue about the Chinese White Dolphins. I was thrilled to participate in dolphin and porpoises research and to learn more about the operation of a non-government organization. On my first week, I was welcome by all the loving staff. Over the 3-week course of training, we had numerous sightings of Chinese White Dolphins mostly in West Lantau and Southeast Lantau. For myself, the scenes of mother-and-calf were exceptionally breathtaking. Because this suggests that the animals are actually thriving in our Hong Kong waters and are still capable of reproduction. An important note to bear in mind, however, is that the dolphins’ habitat used to occupy a much larger range than what it is currently. In the past, the habitat of Chinese White Dolphins had been documented to range from Northeast Lantau Island to South Lantau Island; some were occasionally spotted around the East coast of Lantau Island. 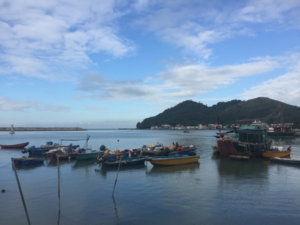 Habitat loss has resulted from the many constructions and coastal development around Lantau Island. Currently, most sightings were documented at West Lantau and Southwest Lantau; whereas few were recorded at Northwest and Southeast Lantau and almost none in Northeast Lantau. A playful calf breaching in front of our research vessel! Individual range shift has also been identified using our photo-identification method. 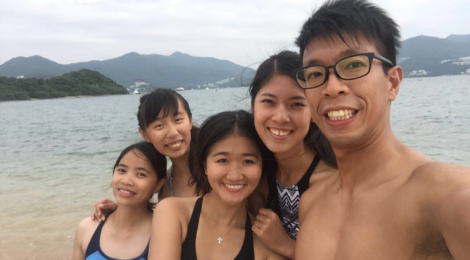 North Lantau residents have been observed relocating in West Lantau, while residents from West Lantau have migrated to Southwest Lantau. Since cetaceans are highly social species, range shift could potentially result in severe impacts on social structure and foraging activities. Construction could also introduce barrier and lead to habitat fragmentation, which could alter and prevent movements of the animals. The Hong Kong dolphin is a subpopulation of the Pearl River Delta region population. Individual movement from one subpopulation to another could facilitate gene flow and therefore, increase genetic diversity of the entire population. Therefore, even though the animals are surviving in our waters, they are possibly facing other unforeseen genetic issues, including genetic drift which is susceptible in small populations, and increase chance of inbreeding. After a 3-week long training by all the loving and caring staff, including Heyman, Taison, Vincent, Grace, Charlotte, and Samuel himself, I have been given the opportunity to go on-effort in the vessel survey. It felt great to be able to get more involved after receiving all the help from the staff. I panicked a little bit in the beginning but with more practice and training, I felt more comfortable working with the crew. Other than boat survey, we also conducted land-based survey to monitor the Chinese White Dolphins’ behaviour and movements in the absence of any research vessel disturbance. 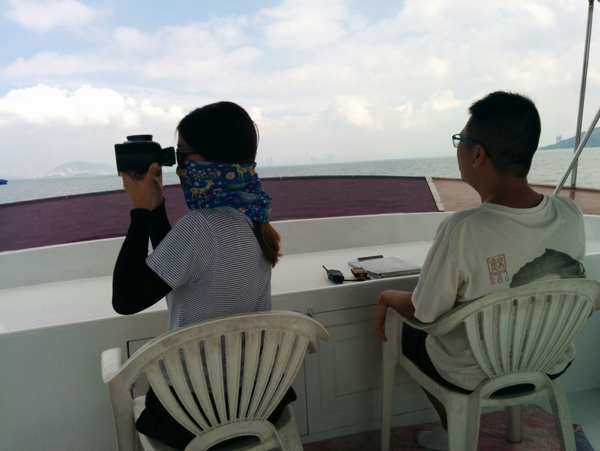 The Shum Wat land-based survey station in particular served to study the impacts of the HongKong-Zhuhai-Macao Bridge construction on the Chinese White Dolphins. The construction could potentially form a barrier disconnecting Northwest Lantau and West Lantau. As the season became drier in October, we started having an increase number of finless porpoise sightings. A distinct difference between Chinese White Dolphins and finless porpoises is that the latter tend to be fairly shy around boat vessels and are prone to any human disturbance. Therefore, it is usually harder for us researchers to locate when the animals surface. But this interesting character of the finless porpoises certainly piques our curiosity and desire to study their behaviour and social structure. However, little is known about the finless porpoises because they are relatively hard to study without dorsal fins, which could be used for individual photo-identification (a methodology used to identify individuals of Chinese White dolphins). A super fun day! Us out at Sharp Island, Sai Kung doing some water sports – kayaking and stand up paddling. Last but not least, I would like to express my deepest gratitude to all the friendly staff I met during this past month! I surely have a lot more to learn from this internship experience (and indeed I am learning something new every single day). Stay tuned for more updates on my journey! Till next time. Cheers.